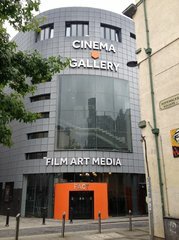 Our award-winning FACT building houses three galleries (showing four exhibitions per year), a café, bar and four cinema screens, run by Picturehouse and showing the best in independent and mainstream film. FACT also runs its own film programmes, focusing on classic and art house. Since the organisation was founded in 1988, we have commissioned and presented over 250 new media and digital artworks from artists including Pipilotti Rist, Nam June Paik, Bill Viola, Apichatpong Weerasethakul and Isaac Julien. Our Engagement and Learning programmes offer a range of opportunities for people to get involved with creative technology and digital projects, and our Research team works with partners across the creative industries, health, high education and arts sectors to develop innovative projects. FACT is a member of LARC, a partnership of eight of Liverpool's leading cultural organisations set up to help ensure that the cultural sector plays a significant role in the regeneration of the Liverpool City Region. We are based in the heart of the bohemian Ropewalks area of the city, and through our partner organisations and businesses help drive regeneration of the area.